$172.69 if items purchased separately. 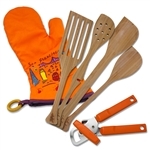 Left-handed cooking tools are ergonomically designed with the ends angled for use in the left hand. Set includes a spatula, stirring spoon, wok tool, and the very popular pot sitting spoon with perforated bowl. Left-handed oven mitt has heat resistant fabric on the bottom when worn in the left hand. Left-Handed can opener rotates around the can to the left - much safer for a left-handed user. Left-handed cooking shears have the blades reversed so that the action is natural when used in the left hand. These shears are difficult for right-handers to use, but work perfectly for lefties! Left-handed measuring cup has the measurements written so they can be read when held in the left hand! Left-handed knives are sharpened on the right for precision in left-handed cutting. Left-handed peeler is ambidextrous, rotates in three directions, and is sharpened on both sides of the blade. My husband started cooking more and I realized he was having issues chopping food. So for Christmas I wanted to get him a gift he could use. I fell in love with it as a right handed person I never realized how many things were not made for left hand people. It came in the mail on Christmas Eve. He opened it and it brought tears to his eyes. He told me he felt seen and he was so happy to be able to cook more without struggling with the knives. He was impressed by all of the items that came with this set. I was the MVP of the house thanks to you. Thank you for selling things for left handed people in this right handed world. People were so shocked and surprised when he showed them the gift. They were rushing and asking me where did you get this from and I tell them all about your site. People have said they will check you out. And if I come across any other left handed person in my life I will let them know about the great things you are doing over here. I have been looking dor items for my partner that is a lefty. The selection is great and the order process is fast ans simple. Christmas/Yule/welcome to the family gifts. I shall have to let you know what they think when the time comes.